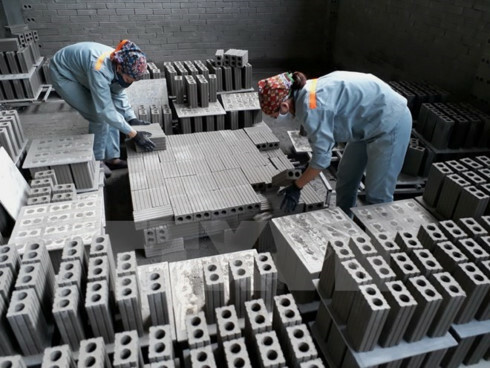 Buildings in Hanoi and Ho Chi Minh City with more than 30 percent of funding sourced from the state budget capital, non-budget state capital and loans from State-invested businesses must use 100 percent non-baked building materials. This is a new regulation stipulated in Circular 13 recently issued by the Ministry of Construction with a view to controlling pollution and protecting natural resources. The rate of the compulsory use of non-baked materials varies according to regions to ensure its feasibility. The rate must be at least 90 percent at structures located in the third- and higher-tier cities in provinces in the northern lowland and midland and the southeastern region. In other areas of these provinces, the rate is at least 70 percent. For the remaining provinces, the rate is at least 70 percent for structures in the third- and higher-tier cities, and at least 50 percent in other areas. The ministry also regulated that buildings with nine or more storeys must use non-baked materials for at least 80 percent of construction materials. Meanwhile, buildings that do not use non-baked materials due to specific requirements must get approval by competent state agencies. The construction ministry said the State encourages using non-baked materials at construction projects regardless of their capital sources and storey number. Investors are also encouraged to change construction designs to use non-baked materials. The circular will take effect on February 1, 2018.